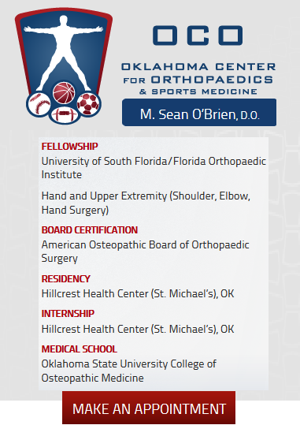 Dr. Sean O'Brien, of the Oklahoma Center for Orthopaedics and Sports Medicine, has provided Orthopaedic care for sports-related injuries to hands, shoulders, feet, hips, elbows and other problem areas, since 2004. Dr. O’Brien is a fellowship-trained orthopaedic surgeon that is dedicated to providing excellent care to patients of all ages. Dr. O'Brien graduated from Oklahoma State University College of Osteopathic Medicine, and completed his internship at Hillcrest Health Center (St. Michael’s), OK.
Dr. O’Brien accepts most major insurance plans and workers’ compensation. If you’re experiencing pain or discomfort, don’t wait - call orthopaedist Sean O'Brien, D.O. today at (405) 703-9378 to schedule an appointment! Copyright © 2018 ocosportsmed.com All rights reserved.